It’s no secret that the teen years are difficult. They’re hard for everyone: parents, teachers, younger siblings that have a teenage brother or sister (believe me – I am the youngest of 3 kids, I have really lived through this! ), but most importantly, the teens themselves! But there is also so much GOOD and beauty (between the braces and acne marks) that comes from being a teenager. It’s a time when you start to see the world from a new perspective; you’ll no longer have your parents with you 24/7, shielding you from the cruel world. People will start doing things, wearing things or saying things to influence you. And you might even think you need to do it too, just to feel cool. You’ll feel stressed from balancing schoolwork and sports, all while trying to get a job to make some money (since your parents will probably stop paying for your shopping sprees!). You’ll lose friends and deal with competition or drama. But being a teenager is also a time when you start to find who you are. I’m not saying you will completely find yourself, because I’m 18 and I still don’t even feel like I know myself 100%. But you’ll start to realize what you do and do not like. You’ll think about your future and what you want it to look like (or you might still have no idea what you want to do in your future, like me 🙂 ). You’ll find new passions and friends that have similar interests as you. It’s exciting!!! And as many times as we might tell you that we don’t need you… The truth is, we DO need you! Teens still need their parents help, just in a different way. We now know how to tie our shoes and make spaghetti (in most cases! ), but now we need your help dealing with the stress from school, the drama between their friends or the competition between the other players on our sport’s team. 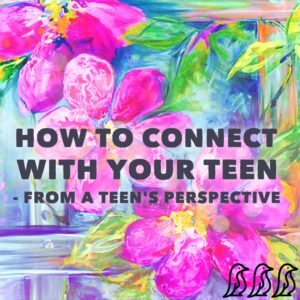 My advice on connecting with your teen, coming from a teenager? Just be there for your child whenever they need you. When I was going through one of the hardest times of my life my senior year, my parents were always there for me. I never felt like I was alone, thanks to my parents constant encouragement and love. My mom has gone out of her way throughout my childhood to connect with me. She’d also always plan Mother/Daughter outings for my friends and our moms, all together. We had mother/daughter book club once a month, mother/daughter tea parties, mother/daughter day trips to a local lake or park, and mother/daughter dinners (which we still do often). I think since my mom started this at such a young age, I’ve gotten really used to hanging out with her along with a friend and their mom, and we all look forward to it! If you’re looking for suggestions on other ways to connect, I suggest doing something your teen likes to do. Whether it be video games (you could ask him/her to explain what they’re doing in the game), or baking/doing crafts/puzzles/going to the gym…whatever it be, the point is to do something with them! Even if you’re just watching tv, that still counts as being together. Maybe go for a quick walk around your neighborhood or park after dinner some night. It’s important to note that like everyone, they will probably/definitely want their alone time, so don’t be offended if they don’t want to hang out with you all the time. They still love you! But just make it clear that you are still there, and are ready to spend that quality time with them, when they are ready. The teen years are such fun times, and a lot of experiences we have during this time shape us into who we will become. Both teens AND parents need each other, and are lucky to have each other during these exciting times! 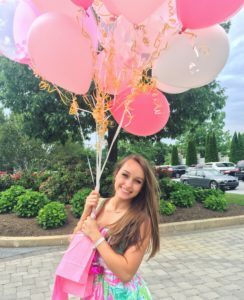 Lauren recently graduated from High School and will attend University of Delaware in the fall. She enjoys traveling, running (very slowly), and finding a good deal at Marshall’s. Her love of celebrating life and creating traditions with her family, along with her passion for hand lettering and painting, lead her to start her own business, LettersByLew on Etsy. There, she has released “seasonal chalkboard bucket lists”, and has several other handmade products that will be featured on her website in the coming months.